In case the greeting card from your mom got lost in the mail, I am pleased to inform you that it is National Cheeseburger Day. Wait, didn’t National Cheeseburger Day happen, like, just a few months ago? No, you big doofus. That was National Hamburger Day (May 28; mark your 2019 calendar). Today is all about hamburgers that for sure have cheese on them, even though hamburgers without cheese are strictly for grumpy Chicago newspaper columnists. Because National Cheeseburger Day doesn’t exist for much else than the talking about and the thinking about and the eating of cheeseburgers (really, more ritual would help the holiday catch on), food editor Garrett Snyder hipped us to six burgers (with cheese) that you should try, if not today, then at your earliest convenience. Yes, you are probably going to Rappahannock Oyster Bar—which opened earlier this year at ROW DTLA—to slurp oysters. But if the burg mood strikes, try the Rapp Burger, a gloriously sloppy take on the double cheeseburger, with double meat, double cheese, bread and butter pickles, and a smoky special sauce. This South Asian spot in Palms has nailed an American original, with a twist. Their M&G’s house burger has patties made of Angus ground chuck topped with caramelized onion, roasted garlic relish, Cheddar cheese, and a house-made sambal aioli. Rossoblu makes what might be the best Bolognese in L.A.—and now they’ve gone and put it on a burger. Served only at brunch (rude), the Bolo Burger is made with Prime beef patties stacked on a milk bun with cabbage slaw, Fontina cheese, and ragu Bolognese. It’s like the chili burger went to Italy for the summer and came home hotter. 1124 San Julian St., downtown. Sumo Dog recently vacated its Koreatown space (which was then taken over by vegan burger joint Monty’s Good Burger) and defected to Santa Monica. In the new location, they’ve branched out beyond dogs and have begun slinging a chili and cheese burger that rules. Along with spicy miso chili and American cheese, it also features togarashi cheese sauce, crispy onions, scallions, and mayo. 1315 3rd St., Santa Monica. The Hollywood sandwich shop is known for its Vietnamese sandwiches on French bread, but the burger—served on a Kaiser, not a baguette—is worth a try if you’re banh mi’d out. 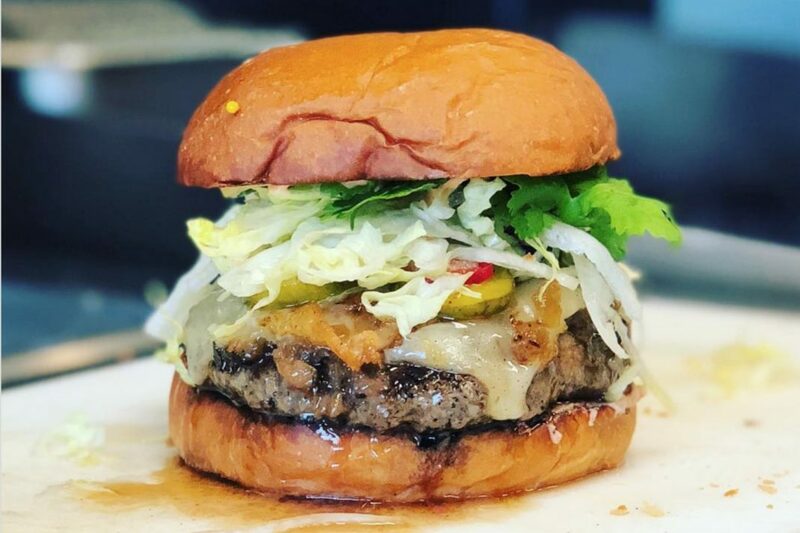 The Oui Burger’s half-pound patty is topped with pepper jack cheese, pickled Fresno chiles, sriracha mayo and—for that “oui”—chicken liver paté. Yes. Yes. Yes. 1552 N. Cahuenga Blvd., Hollywood. This weekends-only treat is a burger-French dip mashup that makes slogging through the workweek seem almost worthwhile. Two beef patties are topped with queso de bola (aka Edam cheese) and Toyomansi-stewed onions, and served alongside a bowl of bistek jus. Everything’s better with gravy. 727 N. Broadway, #120, Chinatown.